A few weeks ago I checked when was the very first post on the Very Northern Florida Cycling Blog: 28th of November, two years ago. I thought I might also be able to spam some posts to get the 200th post to coincide. I didn't spam enough, so this is only post 193 including the drafts that were not published. Most popular post has been the pileups in southern Finland last year. (Oh, by the way: there's a blizzard on Friday so there might be a re-run.) After that there are several Autumn Posts (browse the sidebar to find them, I'm not adding them all here), Car Centric Toys, the image manipulations for shared space and of course the EST safety system for winter cycling. EST seemed to work fine today, even though it was only -10°C. What's on the future? Will there be a third year of VNFC? Maybe. At least with the KiviSydän (StoneHeart), the underground parking garage also known as the Big Dig will be providing me material for photos and videos as the construction goes on. Only it'll be underground so what's there to see? I'd read on the local newspaper that a new bridge has been opened for traffic. The bridge was built connect one of the islands at the mouth of the river to the mainland.The bridge is where the green smudge is on the map below. Oh, wait! What's that thing on the right? 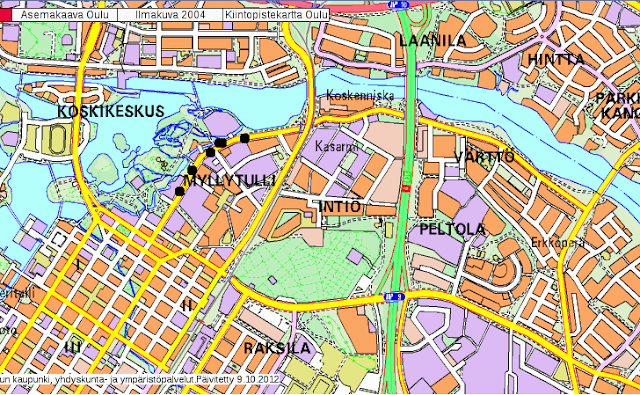 It's the old bridge, and it's pretty much on the desire line of people going east towards downtown or pretty much anywhere in Oulu. So why was the new bridge built? The distance between the old bridge and the new one is about 500 meters, so the savings in time and vehicle kilometers are minimal. For pedestrians, saving a kilometer or two is huge. But for a 20km/h cyclist that 2 km is a only 6 minutes saved. They should have built a bike/ped bridge and let the motorists drive. 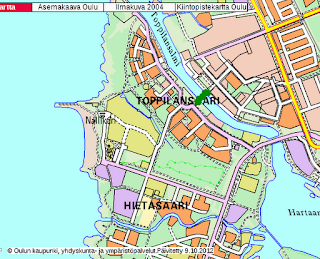 Well, people north of the water wanted a shorter trip to Nallikari (camping and swimming area etc) and people on the south wanted a shorter route to shops north of the river. Lots of new housing has been built on the island lately, and construction on the north side is going on. So, I got curious and decided to go and see the bridge for myself. Rather than looking at the map or reading the newspapers more carefully to see where exactly this new bridge was, I decided to just hop on the bike and try to find it by guessing. The maps at the beginning of the post were made after the ride, when I started writing this. My first guess where the bridge was that it would be somewhere behind the power station. It seemed logical: the route would continue straight across the bay, without any turns. But what the heck, they've blocked the street and built a fence. Looks like that was not the route to the new bridge. As I knew there already was one bridge to the island, I thought it might be further to the west, closer to the sea. It wouldn't make any sense to build them too close to each other, would it? After riding on soggy gravel paths through thickets I finally came to a clearing where I could see where I was. Now, that tiny thing in the middle of the picture looks like the sightseeing tower on the beach of Nallikari, also seen before on this blog and on my YT videos. It's on the west coast and the island ends there, so I must have gone a bit too far west. As there was nothing but bushes between this spot and and the power plant, the bridge must be on the other side of the power plant. After retracing my steps and trying another route I finally found myself behind that big red building. Here's a video of the ride from there to here and then back over the bridge. I'd say a lot more people than normally would see on a bridge, so they were sightseeing too. The bridge from the side. Not very spectacular. Just across the harbor canal. At one end of the bridge there is this nasty gap, a movement seam I guess. The new bridge looks good, and I'll be monitoring the newspaper to see how long it'll take until there will be complaints of increased traffic on the new rat runs. As both motorist bridges are on the same end of the island it is kind of a dead end for motorists. But more of the traffic shifts to new streets with the new bridge. The only through traffic they get is a few bicycles and maybe some people on foot too. The island has a bike/ped bridge in the east, and before the new bridge the island has not been the shortest route anywhere. Now there will be new routes available. Even I will be using it on my trips to the Nallikari beach. Now that I have found it! There was some black ice on the bikeways. The ruts look so shiny. All the snow has once again melted due to the warmer days and rain. And here's a video from Saturday. I was trying to go to the bridge, but my video equipment had problems again. So this was about the only footage I got from my ride. In the "Improvement or not" roundabout I noticed that three of the legs had crossings over them, even though they seemed useless. See, the path ends after 10 meters. What was the point? Erm, maybe the bus stop? Just on the other side of the street. And they might continue the path another 200 meters, as this could provide an alternate route with less steep uphills. But I don't think they will, it's just a spaceholder. Today I read an interesting-ish article in the local newspaper. The article was about how one street south of the river was getting congested and dangerous when the rush hour hits. The street is marked with the black dots below, and that's where I tried to get video. My crappy camera kept being crappy and kept shutting down so I only got two short clips before I called it quits and just rode home. Anyway, bottom left is the downtown of Oulu, as you can see by the grid streets. The yellow roads are bigger streets and the green road in the middle is the former Europa 4 highway going all the way to Spain. Now it's just Highway 4. Visible in the picture are the 4 bridges crossing the river. Someone coming downtown from the suburbs in the east or northeast is very likely to use the yellow roads. And on this problematic road or nearby there are also a lot of destinations for pedestrians and cyclists: a couple of schools ranging from primary to vocational schools. And I'd guess about half of them are on the wrong side of the street so people will be crossing the road. And as the road goes west-east it's also a barrier for anyone cycling to school or work in the north-south or south-north direction. So there's also a lot of cycle traffic. Just above the black dots you'll see a thin line crossing the river: that is the dam bridge. A lot of people use it to get across the river instead of the yellow roads. And there is also a lot of other thin white lines: they're bikeways. You could actually avoid the problematic spot by riding on the bikeways next to the river, but that would make the journey longer. In the article they wrote about how there was a lot of car traffic just going through, and to the schools in the area. They wrote about jaywalking and pedestrians and cyclists not having reflectors and/or lights. They wrote how parents bring the smaller kids to school as the traffic is so heavy, but did they mention that the school run is part of the problem? I don't think so. To make things worse, there's also construction going on in the area. Even one of the schools is actually closed for repairs. The kids come to the school in the morning, but they're taken to another school by buses. So there's a few school buses waiting on the street. And HGVs and lorries might be bringing deliveries to the construction sites or they just had to park some big machines in the street. And so they had to block the sidewalk. Some "road safety organization" expert is moaning that many cyclists do not cross the road to ride on the MUP on the other side of the road as the signs suggest they do. 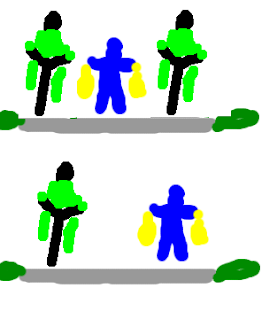 Instead they opt to riding on the street. The law says they "usually" should use the MUP, but when it's on the wrong side of the street I don't think you'll get a ticket very easily for riding on the street. Especially for a short stretch like this. What makes me laugh at his comments is the earlier part of the article, where they talk about pedestrians trying to get across the road at zebras and waiting and waiting for a gap in the traffic. In busy rush hour traffic, that wait might be a long one. At first they write about how hard it is to get across the road, and then they want cyclists to cross the street twice (if their destination is on the same side as they were originally). Well, I suppose the safety expert guy didn't know what was going to be written just above his comments. Does the road at the end of the video look wide enough to have a protected on-street bikeway? It certainly looks like it to me. So why did they do this "cross the street twice" nonsense? Maybe they want to park the HGVs right next to the construction site. Maybe they need huge machines to blow holes in to the wall of the building so they need access every day and it's just not possible. Maybe they didn't know better. But I'm feeling charitable today so I say I think the real reason is they know winter is coming. Making an on-street bikeway around the site is easy, but how do you it gritted and plowed? After all, this isn't Amsterdam! The construction of the underground parking garage have continued. One street has been cut from motor traffic, as they're digging up the sewers and water pipes and what not to make room for another entrance to the garage. This street is blocked for through traffic except for pedestrians and cyclists. Obviously blocking streets will cause chaos and confusion among the drivers, as they have to change their routes. I never expected them to be so confused they would think themselves as pedestrians, though. The situation starts as the dark car reverses back out of the dead-end. Maybe it was parked there, or had tried to find a space for parking on the central reserve but lucked out. There should be parking restrictions on a spot or two so cars could drive over the reserve to the other side of the street but apparently parking is more important than convenience and safety. Well, the blue car blocks the way out so the dark car goes pedestrian and uses the pedestrian crossing as the route to get away. Now the blue car wants to try it's luck finding a parking place. After a few colder days on the weekend we had some warmer weather. On Tuesday we had temperatures around zero Celsius and some rain and sleet. The snow on the trees melted. Picture from Tuesday 30th Oct. Yesterday the day had highs a few degrees above freezing but in the evening it colder and the bikeways were nice and crispy and crunchy, as the slosh refrose. Today it was another warm day so the bikeways had rutted ice and slosh. Interestingly, one fork of the river below the dam was partially frozen already. A bit further out the waves keep the ice from forming. It's warmer under the bikeway bridge so the cut off point seems to be there. The forecast for the next few days has above freezing temperatures and rain, so the snow will be gone, but there will probably be black ice if it gets cold enough during the nights. The other is shows a real life braking test on a snowy bikeway. Not really icy yet because the snow hasn't been trampled on enough, but there was some ice on it anyway. The big trucks do not have studded tyres so they're pushing the limit a bit by stopping at a steep hill. I'd say they couldn't have fit trough the underpass, so they would been stuck if they couldn't get up. They could have turned left or right but came up straight, and afterwards I was wondering if they turned back or drove through the no entry signs to the pedestrian crossing to get to the street at the very beginning of the video. The last of the videos I uploaded is sort of a video response to bicycledutch's cycling past red lights blog post. The Dutch with their bikeways segregated from the road often get to ignore the traffic lights. In T-junctions and when doing right turns there often is no conflict with other road users so why should a cyclist be penalized by a red light. This (cycling past red lights) is common in Very Northern Florida too. Some commenter talked about the aversion to two-phase left turns: having to first cross one street and then wait at another red light certainly is a pain. Even if you don't have dutch intersections, if you have paths on both sides of the street you can cross the street when ever it's best for you and then make the left turn at will. When I looked outside in the morning I saw it had snowed last night. Maybe two inches, so the snow plows had been at work. My neighbours were scraping the windshields of their cars, while I was still having my breakfast. Riding a bike in the winter sometimes saves time! At least when it's only a few degrees below freezing so one doesn't have to put too many clothes on. On the other hand any time I had saved was lost when the rear tyre started to leak. It was empty after the night so I inflated it and I thought nothing about it, but then I could feel the rim making contact while riding. Well the leak is slow so I could get a kilometer for each re-inflation. I also rigged up the camera again, and even edited the video and put them to an usb stick but then forgot the stick at the computer table before I left for weekend. So you won't see the white scenery until Monday, and by that time the snow might be gone again. I was asked in the youtube comments if all the leaves had fallen yet. Not quite all, but most of them. And a lot of needles by these weird spruces. Here's a clip I put together from my rides yesterday and today. As you can see, it is very much like autumn: ice on the ground and falling leaves and so on. It gets below freezing during the night but usually thaws during the day, so there isn't any snow or ice. Except I did find some for the video yesterday because the day was so cold it hadn't all melted away. And today was windy, and the Oulu River had waves on it. Usually the river is almost as smooth as glass but today I certainly wouldn't want to go out there in a row boat! Oh, I haven't heard by old bike so I got a single speed bike for cheap. Seems that Oulu isn't quite that flat as I thought when I had gears in my bike. Maybe I should get hub gears for it. It's a sit-up bike, with a rack which I like. On the other hand it had flat tyres, the rear axle needed tightening (the ball bearings were about to fall off, typical of some discount stores which don't know how to assemble the bikes properly) and it has no lights which are needed this time of the year. And mandatory, too. So it's taken me a few days of fixing and tuning to get it up. For the lights I've had to hold a lamp in my hand but I got the 'see me' led light system ready, now I've just got to install it. I took an old bike light, sawed it a bit and put a bunch of leds inside. With a bulb it took 250 mA, with leds I can run it less than 20mA and it's still visible. As it has a reflector in the middle of the lens and light goes everywhere it's not really good light for seeing in the dark. The other light project, modifying a head lamp with a 3w led to work as a 'see far' bike light is still in the works. At least now I got the solder and other gear on the table so I might actually work on it a bit. This is what it looked like in the morning. First snow of the winter. It was still snowing so it looked very promising when I took the photo. A little snow on the ground would make the world a lighter place. Isn't it pretty? Green grass, white snow and orange trees? And then, fifteen minutes later the rain changed to sleet and then into water and the snow was gone. Today there was news about a thief snagging a handbag from a lady. This time it wasn't the perp on the bike or a scooter. No, it was the lady. The lady thought the thief was going to push her off the bike but she dodged. It wasn't until later she noticed the bag wasn't on the rear basket. Oh, she was 87 years old and riding a bike. I'm not quite that old and at the moment I'm not riding a bike either. Some darned thief stole my bike! It's an old clunker (a red MTB) but it was my main mode of transport for local trips. Now I have to walk or drive. Blah. Walking is so slow and driving and parking is a hassle. By the way, I was in rush hour traffic congestion the other day. It really exists, it's just that I don't see it while riding a bike. Now I had to drive and I saw it. Amazing. The chances of getting the bike back soon are slim. Many stolen bikes get thrown in to the river and will not be found for years. Some will be taken in use or sold. Some will fill the bike parking in front of the apartments, but as everyone knows only their own bike they can't know some of the bikes do not belong there. And every few years they donate the abandoned bikes to charities. If the bike is abandoned in a public place in a way that it looks like it is abandoned, it will go to lost and found - unless someone decides to re-steal it again. Now I'm left with a 26" studded tyre (will my next bike have 26" wheels? ), a speedometer which is useless without the sensors and the lights which I can't mount on the next bike without the mounting brackets. Blah. Well, at least I can use the lights while walking. It's getting dark in the evenings. Here's some photos I took during the summer. They were all taken even further north, a few hundred kilometers northeast from Oulu. I spent some time there, and these were taken when I was out on a cloudberry hunting trip. The cloudberries grow on swamp, as you'll see. You might notice the spruces in the background have branches pointing down and the whole tree is narrower than what you might see here in Oulu. It's because there's more snowfall during the winter and wide branches would collect too much snow on them and break. A few hundred kilometers can make a noticeable difference in the shape of the trees. Here's what one swamp looked like. Not bike-friendly, I tell you! I also saw reindeers in their natural habitat, not tied to a tree in a park in the middle of Oulu. This one was maybe 15 meters away. They aren't very afraid of vehicles so one can get photos of them. There's about three times as many reindeer crashes as there are elk crashes, even though the elk population is mostly in southern Finland where there is lots more people and more traffic. Reindeers live in northern Finland where there's less people. But as they're not afraid of cars they spend more time on the roads. They like to eat grass on the shoulders of the roads (maybe they lick salt, too) and they use roads as places to walk and even sleep. Being gray they're actually pretty hard to see until you're close to them, and then they might get scared by the car and run wildly in front of the car. Last year I blogged about some changes that were made on an intersection on a major cycle route to downtown and I thought they were making the intersection worse for cyclists. So I asked the city council about it and they emailed about the roundabout they were going to build once they got the money for it. Well, I guess the money was available and they'd almost built it before I noticed it, maybe because I've been out of town :-) Two weeks ago they were still building it. Here's a clip showing what it looked like then. The excavator was trying to get out but the cars got in the way. And here's what it looked like today. Looks quite good, actually. It just isn't smooth as the road is about two inches lower than the bikeway. Even though the kerb stones are tilted to make riding easier it certainly is bumpy. As for the other construction project, the Big Dig aka the underground parking garage, they've fenced off half the market square. The fences are not that interesting and they block the view of the beginnings of the tunnel pretty effectively so I haven't managed to get good pictures about it yet. It's been a long summer without posts, sorry. I did take some photos during the summer, but I've been busy and with limited net access the whole summer so when I had time it was mostly to check my email. The photo below is a gravel path. It's not part of the official bikeway network, and if I recall correctly it doesn't get plowed in the winter. Still, it's a path and can be used as a shortcut so it gets it's share of people on bikes, not just dog walkers and people taking their evening stroll around the block. If I recall correctly this photo was taken in late July. The whole summer has been rainy, as in "most rain in 100 years" rainy. Low pressure zones kept coming and it has rained almost every day. Or at leat it feels like it. There were a few cases of heavy rain causing floods in downtown, where the plumbing is old. There was so much water in the underpasses going under the railway track that some cars couldn't get through and stalled when they sucked water inside the engine. And when the whole area is pretty flat rivers flooded too. There's been reports about a dairy farm that was blockaded by water for a week, and others lost all their crops for the year when the fields had two meters of water in them. 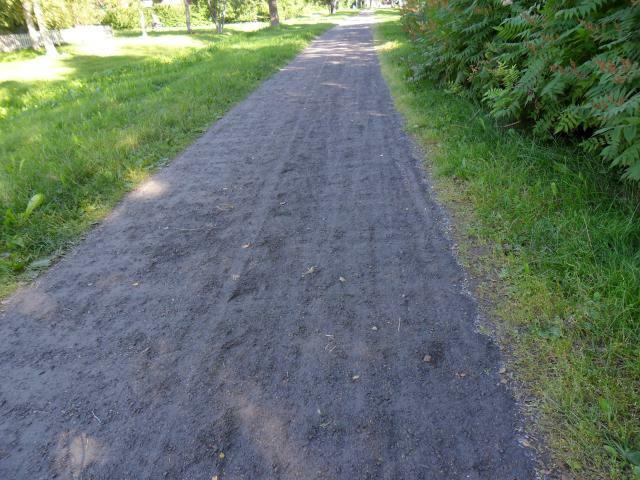 So these gravel paths might get some rain damage with the runoff washing away the gravel or the whole path turning muddy. Looking at the path it's obvious there's no damage because it has been maintained. But I wonder if they did the washboard on purpose to get cyclist off the path to the real bikeways, or did it happen naturally? Because that path was rather nasty to ride on. And I think it would wake up a baby in a pram too. Last week a moped car ( a lightweight, fourwheel vehicle that looks like a car but goes only 45 km/h) crashed with an ambulance on an emergency. Two were killed. Car drivers seem to be annoyed with such imposters and complain about their lack of training, running red lights etc. Pretty much the same complaints they have with mopeds and cyclists ( and pedestrians, too). Microcar accidents are often at intersections or rearendings. Both are symptoms of lack of experience on the part of the driver (mostly teenagers). Also because most moped cars are in cities which have intersections and other cars to rear end with. And more often than not the driver is at fault. Before only a theory test was needed to get a drivers license for a microcar. The regulations have been tightened and now there's also a driving exam which should help a little. You'll find there will be less updates during the summer. I''ve decided to limit my time on the computer in the summer and I'm out there enjoying the sun and warm weather while they last. Including riding a bike at midnight. The Midsummer Day is a few days and as some people already say the summer is almost over after that and the winter is coming back. Not everyone wants to hear that before they even have had their summer holidays in June. :-) Although it's true! 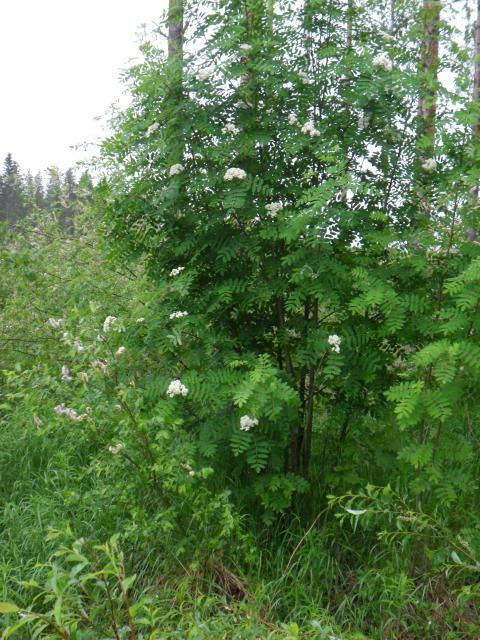 Right now there's lots of flowers and trees in blossom like the rowan in the photo. Smells nice too! Another boring video clip to keep you entertained. This one is from a ride from a few weeks back, when the grass was still brown. The chunks of ice in the underpasses had melted though, so it must have been May. It may look like it but this is not out of the city, but it certainly is out of the downtown grid streets. Maybe it'd be the suburbs then. Noisy motorway is not a nice thing to live next to, so very often there's a noise wall or some woods to give some protection. Maybe I should've included a clip from the non-short-cut route to see if the noise levels are noticeably lower. In the last few weeks several blogs have posted videos of construction blocking the bikeways. As expected, in the Netherlands there usually is a good alternate route with clear signage. How about the signage? Well, there was the rather useless round red-and-yellow sign saying you can't go through here. Some kind of arrow pointing which way to go would have been nice so I wouldn't have tried going left first. And there was no sign for drivers to look out for people going around the fence, but maybe they expected the drivers to use their brains and do it anyway. There are no temporary paths marked by bollards or fences or any limitations on the parking so the drivers are not inconvenienced by the construction. Sure, this is only one of the three routes for bikes and pedestrians (not counting going through the parking lot). So maybe there could have been a detour sign earlier, like 50 meters before the beginning of the video where I could have turned right and taken the other route. The Finnish traffic law says mopeds are allowed on bikeways (MUP's) if there is a sign saying so. Often the sign is there. The other part was that the speed differential with other users of the MUPs was too big. A moped has a max. 50 cm3 (or 4 kW if electric) engine and has a maximum speed of 45 km/h. It is rather easy to do some changes to make the moped go faster (60? 80?). And who would be likely to tune up their moped to go faster? Maybe the reckless youngsters. Mopeds going over 45 km/h among pedestrians... not good! In August 2010, most of those signs were removed in Oulu and mopeds had to ride on the streets (default speed limit in urban areas is 50km/h, could also be 40km/h or 30km/h) and on roads with speed limits of 60km/h or less. If the speed limit was higher and there was no other route, they were allowed on bikeways next to the road. It's the speed differential thing again, only mopeds are the slow vehicle this time. There was another cry in August 2010: the mopedists would be slaughtered by the cars. Some parents were afraid their kids would get hurt if they had to use the streets. Others said the reckless mopedists don't know traffic rules and shouldn't be allowed on the roads. A research comparing injuries before and after the change shows safety improved 70%, says the local newspaper. I haven't seen the article in print, but the short web clip says in the year before the change (Aug 2009-Jul 2010) there was 53 injuries involving mopeds. A year later the figure was only 16! Unfortunately the short version of the article on the web page doesn't give exact figures for pedestrian, cyclists and mopedist injuries in moped related crashes. So I can't tell you how many less grannies were mowed down by the mopedists. Neither can I tell you if there has been a decline in trips taken or kilometers travelled by moped. Fuel prices have gone up, but the mopeds are not exactly gas guzzlers. One might make an educated guess that there might be less mopeds in the winter than the previous year. The moped riders had to move from well gritted and snowplowed bikeways to icy, rutted streets and roads, which are not gritted or plowed well enough for two-wheeled vehicles. On the other hand, riding a moped in the winter is very cold. You're just sitting there and you're not getting heat by using your muscles like when biking. And what I recall, there weren't that many moped users in the winter anyway. Anybody who has been reading Hembrow's blog knows he has written how in the NL the different modes (or speeds) of traffic are often kept separate to reduce conflict and damages done by a collision. Their bike paths for bikes only are world famous. Unfortunately, in Finland many politicians and traffic planners think streets are for cars and they use 'light traffic roads' (also known as MUP, multi-use paths )for everything else. Looking from the windshield perspective it seems dangerous to have unarmored mopeds on the streets, they might get hurt! Not to mention they are slowing down the traffic! This is why allowing mopeds on MUPs has been widespread even if it puts fast moving mopeds among dogwalkers and kids and grannies. Now that Oulu has shown the example and has statistics to show it works and is safe, some other cities are doing the same. It certainly has calmed down our bikeways when the noisy contraptions are gone! It's 1st of May again. Besides students getting drunk, parades, annual May Day motorcycle ride and the concert there was the market. I was getting bored and it was a sunny day outside so went so see what they had for sale. I uploaded some videos: on the way , parked at market and leaving , Crowd at Concert and Red Nose. Crossing the river I saw the ice is breaking apart. I hope any of the students who decided to go swimming (read: was thrown in by his friends) didn't catch a cold. A nice day for a riverside picnic. It was +2C and windy, but at least the sun was shining warmly. It wasn't cloudy, it just looks like that on the photo. Bikes parked all around the market square, and also on the pedestrian streets I visited later. There was no sign of the construction of the car park yet. IIRC they'll start to dig the tunnel here at the market square somewhere. Unfortunately the selection at the market was the usual: cheap jewelry and other trinkets, candy, some food, even t-shirts. The only thing that caught my eye this time was these baskets made of thin strips of wood (don't know the word in english) and some tin pots. The baskets looked very nice. And then I went to listen the concert at the pedestrian street but I didn't take any photos. Even the video clip caught just the end of one song.